The human mind is notoriously bad at probability. We think a medicine that allegedly helped a single friend or celebrity is more likely to work than one that has withstood scientific trials. We think we are more likely to win the lottery than to be struck by lightning (especially if we’ve been good), but the reverse is true. If we have no idea whether an event will happen, we tend to lay the odds at 50-50. It should come as no surprise, then, that many people would make the wrong play in the following scenario. What would you do? You’re a contestant on the old game show, Let’s Make a Deal. 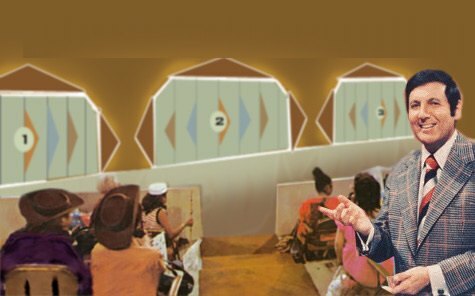 The host, Monty Hall, shows you three doors and you get to pick one. Behind one is a car; the other two conceal goats. Let’s say you pick Door #1. The audience is shouting at you. Your friends are watching from home. You’re sweating under the stage lights. Before you know it, time is up. If you guessed that it doesn’t matter because you have a 1 in 3 chance of getting the car in either case, you’re in good company. Most people would agree with you. However, the truth is that switching doubles your chance of winning. When the smartest person alive, Marilyn vos Savant, explained this in her column, she got about 10,000 letters claiming she was wrong, including 1,000 from PhDs. It confuses a lot of people. In fact, someone has written a whole book on the subject, partly to show how befuddled we get when reasoning about probability. The best explanation I’ve found goes like this. If your strategy is to always stick with your initial choice, then of course you have a 1 in 3 chance. However, if your strategy is always to switch, then you only lose in the case where your initial choice was the car. (If your initial choice was a goat, and Monty just showed you the other goat, then switching will always get the car.) Your initial choice will be the car 1 out of 3 times. The other 2 out of 3, therefore, are wins for you. You win 2 out of 3 times by switching! You might win some money at the bar with this. Get 3 opaque cups to serve as “doors.” Offer to a friend that you and he will each put up a one-dollar stake, so there will be two dollars in play. Your friend will be Monty Hall, putting the money under one of the cups while you aren’t looking. You will guess a cup, and he will offer you the chance to switch after showing you one of the empty cups. If your friend is like most people, he will think he has the advantage in the game, for he will think that you will win just 1/3 of the time. However, you will win, on average 2/3 of the time. For your $1 investment, you will get an average of $1.33 (2/3 of $2). Not bad for 30 seconds’ work! Maybe you can sucker your friend in by letting him play Contestant for the first few rounds. He will probably switch half the time and stand pat half the time, which does make it an even-money game. He will think the game is fair, and let you be the contestant after that. This entry was posted in Truth and tagged Math. Bookmark the permalink.